Since the sixteen-bit console era, American publisher Working Designs localized several Japanese roleplaying games, such as most entries of the Game Arts-developed Lunar series and occasional titles of other videogame genres. The U.S. publisher was renowned for injecting a dash of humor and cultural references into games it translated, although others would accuse their works of being Macekres (pronounced like “massacres,” after Carl Macek’s Americanized anime localizations), not to mention increasing the difficulty of titles they localized. 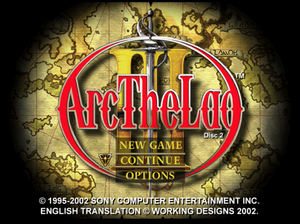 Towards the end of the Sony PlayStation’s lifecycle, the publisher translated the system’s entries of the Arc the Lad series as the Arc the Lad Collection, with the final entry, Arc the Lad III, ending the trilogy on a high note. The third game occurs several years after an event known as the Great Disaster that occurs at the end of its predecessor, with a young boy named Alec saved from the epicenter of the cataclysm by a Hunter, consequentially wanting to become one himself, setting off across the world with his friend Lutz, and ultimately coming into conflict with a scientific organization known as The Academy bent on bending the various lands to their will whilst allegedly bettering humanity. The plot is perhaps the strongest of the trilogy, with more humor than in its predecessor, and interesting side-stories dealing with eccentrics such as Spicy the ninja, the only real hangup being the inability to get reminders on how to advance the central storyline. Working Designs’ translation is mostly good, with their typical brand of humor, although as with other games the company localized, Victor Ireland seemed a bit preoccupied with the word “scarcely” that sounds somewhat unnatural, and as in the prior translated Arc the Lad games, the company made the lazy decision to leave the voice acting in Japanese. The dialogue further sounds occasionally unnatural, and the rare American popular culture reference seems out of place in a Japanese RPG, but fortunately, there aren’t any glaring technical issues as there were in the localized second game. Arc III features the most refined tactical gameplay of the PlayStation entries, although some may lament the reduction of party size from five to four characters. The player’s allies and the enemy exchange commands based on agility, with one major improvement over the second game being that the player no longer needs to center magical spells on foes to execute them, and that fact that physical attacks are far more useful than in Arc II. One major issue is a late-game battle where one character has to face four magicians on her own with lower levels, although the right element-guarding accessories can make the fight more bearable, and losing fights restarts them with all participants fully restored. Overall, the gameplay definitely helps the tertiary entry more than hurts. Another major improvement over the second game is the disposal of limited inventory (oddly not a problem in the very first game of the franchise), the third further having a methodical mission-based structure centering around the secondary title’s guild system. Although the game largely points players in the right direction, some reminders on how to advance after quitting for a while would have been welcome, but interaction still isn’t terribly burdensome. Arc the Lad III sports perhaps the strongest soundtrack of the PlayStation trilogy, with a nice variety of energetic battle themes, characters such as Cheryl having their own tracks with occasional remixes, a beautiful vocal theme song in “The Way of the Earth,” and other whimsical pieces such as the underground ruins music. The battle voices, as mentioned left in Japanese, largely fit the characters, although Lutz actually sounds a bit like Steve Urkel from Family Matters, and while some of the voicework, even with some knowledge of the language, is mildly coherent, most sounds like gibberish. Even so, a superb-sounding game. The third game marked a significant change in visual styles from its predecessor, with character sprites containing much better anatomy, and scenery being three-dimensional, with CG FMVs actually featuring characters in them, as well. The spritework for characters and enemies (although there are occasional reskins) was some of the strongest in the PlayStation era, and the scenery actually doesn’t look bad with smooth texturing, although some may admittedly find the graphical style an acquired taste. Regardless, the visuals are largely pleasant. Finally, the third game is significantly shorter than the second, taking a little over a day to beat if the player forgoes most optional quests, and there isn’t much reason to go through the game again. In the end, Arc the Lad III definitely ended the PlayStation trilogy of the series on a positive note, given its refined gameplay systems, tight control, enjoyable narrative, great soundtrack, and nice visuals, although it does have some issues such as the lack of reminders on how to advance the storyline and the lazy decision to leave the voice acting in Japanese. Some have accused the third game of being the black sheep of its franchise, although this reviewer thinks such criticisms are asinine given the game’s many positive aspects, and those who acknowledge that Arc II isn’t perfect either will likely appreciate the tertiary installment’s polished areas. +Most refined gameplay of original PlayStation trilogy. +Excellent narrative, with a dash of humor. -Reminders on how to advance the plot would have been nice. -Scenery could have used a bit more polish. Ends the PlayStation trilogy on a high note.